1101-356-1 OP8-20B 8-Outlet 20A Rack Mount R56 Surge Type-3 Prot Unit - Talley Inc. 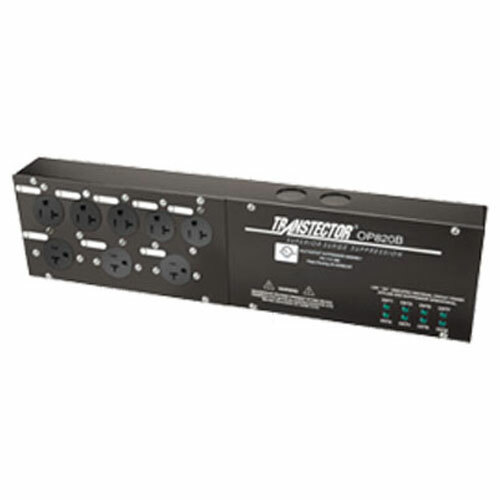 The OP8-20B is a power distribution panel designed with eight individually fused surge protected 120Vac / 20A circuits. The SPD is Motorola R56 Compliant and UL Listed. The OP8-20B uses patented silicon avalanche suppressor diode (SASD) technology to achieve low voltage protection levels at high induced surge currents. Each of the eight outlets is supplied by a dedicated AC feed, and features a 20A fuse and replaceable surge suppression module that plugs directly onto the internal PCB. The status of each dedicated circuit is displayed by eight LED's on the front of the enclosure. The OP8-20B offers flexible mounting options.